Hello, my name is Alexis, and I am a woman who doesn’t want kids. I also don’t want to talk about it. I don’t want to talk about why I don’t want children, or what my husband thinks about it, or how I can bear denying my parents the opportunity to be grandparents. I don’t want to talk about who is going to look after me when I get old, or biological clocks, or accidental pregnancies, or how different it would be if they were mine. I don’t want to talk about domestic population decline, or social security or what I owe humanity or the black community. I just want to be able to say that I don’t want children, and for that to be a fact that can exist in space and time; a fact that can be acknowledged, then left alone. I don’t want to talk about why I don’t want kids, because it is the least interesting thing about me. Honestly. You see, the “Childfree community” has recently gained a lot of visibility, thanks to a lovely picture of a childfree couple “having it all” while lying on a beach somewhere, without a care in the world. This led to a furious cascade of response articles describing the Childfree as everything from unnatural to Un-American, selfish, rational, fulfilled, and everything in between. 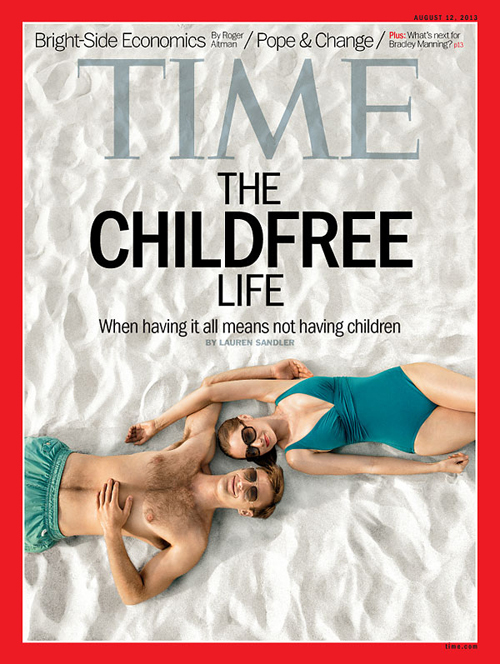 In addition to reinforcing one of the most obnoxious stereotypes about people who don’t want kids (ie, self absorbed), I think where Time Magazine, et al., got this wrong, is that they are making childfree into a thing, but it’s not a thing. I don’t want kids, just like I don’t want a Lamborghini. (Surely me not wanting a Lamborghini is not a thing, right?) Childfree does not need to be reified. Childfree can merely be acknowledged as a benign fact of life, and left well enough alone. Honestly, that’s what most of us want the most. It’s difficult to define a group of people based on what they don’t want, because it puts them in a box then presumes that the box means something. Childfree folks are as varied as parents; we are the employed, the unemployed and underemployed. We are teachers and doctors and lawyers, social workers, writers, artists and engineers. We are introverts and extroverts; we are kind, and we are unfriendly. We are not a monolith, we are merely a group of people defined by our shared experience of critique and scrutiny by a mainstream culture that does not see our decision as valid, or valued. Childfree men and women do not need pity, concern, or even understanding. We simply want our choice to be accepted without push back or further explanation. It is not an invitation to question how we spend our free time, so that people can approve or disapprove of our decisions. We don’t want a soapbox to convince other women and men not to have children, and we don’t want to hear all of the magnificent stories about how fulfilling parenthood is for you in particular. We don’t want to have to prove that we are still good people, or that we don’t hate children, or that we are good citizens that volunteer and help the less fortunate. We don’t want to be subject to some litmus test of how we should be, some acceptable version of “childfree” that society can live with. Most importantly, we don’t want to be made into apologists about our very lives. My name is Alexis, and I don’t want children. Now, can we PLEASE talk about something else?